Memes arise from the meme pool and spread from brain to brain by imitation behavior. Imitation behavior is seen in frontal lobe syndrome. In prefrontal atrophy cerebellar dominance takes over and imitation behavior is a feature of cerebellar cognitive function. The cerebellum plays a crucial role in imitation behavior and transmission of memes. 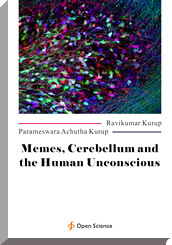 Cultural transmission of memes depends on the cerebellum. Cerebellum is the basis of human culture. The meme will literally parasitize the brain like human endogenous retroviruses. The human endogenous retroviruses cannot spread brain to brain. Genes are limited by brains and there is only vertical transmission of genes by the process of reproduction. Memes by imitation behavior and cerebellar function can have a faster transmission resulting in the creation and transmission of culture. Memes can also affect genomic transmission. A thought or a meme can produce changes in low level EMF and modulate porphyrin synthesis. Porphyrins can intercalate with nucleic acids modulating gene expression. The memes or thought ideas can alter neuronal firing, inhibiting membrane sodium potassium ATPase and increase intracellular calcium and reduce intracellular magnesium. Magnesium is required for reverse transcriptase activity. Thus memes or thought via membrane sodium potassium ATPase inhibition and altered intracellular calcium/magnesium ratios can modulate HERV expression, jumping genes and the dynamicity of the human genome. Memes can regulate the genes. Cultural transmission of memes can modulate genomic plasticity. Archaea can control both cultural meme transmission and genomic transmission. The archaeal magnetite is capable of quantal perception and forms the basis of imitation behaviour. Imitation behaviour is the mechanism by which memes are propagated. The memes get selected from the meme pool depending on its fecundity, copying fidelity, longevity and faster rate of spread. Memes can also evolve as its spreads from brain to brain. Quantal perceptive mediated cerebellar imitative behaviour is the basis of cultural transmission of memes.